Boutique selection of glass, marble and stainless steel blend mosaics with contemporary, cool tones for trendy settings. With its smooth, unglazed surface and its slight shade variation, the Jeffrey Court's Glass and Stone mosaic wall tile can be installed alongside stone or ceramic field tiles (sold separately) to create a coordinated look. Mesh-mounted Mosaics can be used as a whole sheet or cut to make affordable feature strips. Recommend white polymer-modified thin set and non-sanded grout for best installation results. With its textured, unglazed surface and its slight shade variation, the Jeffrey Court's Mosaic Wall Tile can be installed alongside stone or ceramic field tiles (sold separately) to create a coordinated look. Mesh-mounted Mosaics can be used as a whole sheet or cut to make affordable feature strips. Recommend white polymer-modified thin set and either sanded or non-sanded grout for best installation results. 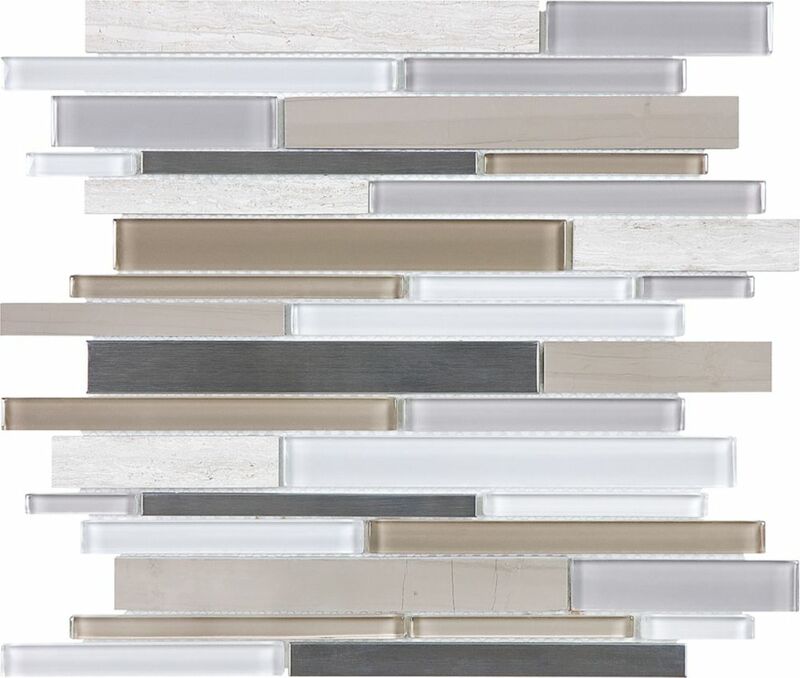 Random Strip Mosaic Blend Tile in Warm Mica Boutique selection of glass, marble and stainless steel blend mosaics with contemporary, cool tones for trendy settings. Random Strip Mosaic Blend Tile in Warm Mica is rated 4.5 out of 5 by 2. Rated 5 out of 5 by Michaella from Beautiful tiles! I used these tiles as an accent for my bathroom renovation. They look even more beautiful than I thought they would. You do have to be careful in how you apply them, but I had a professional do it for me.